This is a variation of the classic American dish, Macaroni-and-Cheese. The variation from the classic recipe in this one is that I used four cheeses...cheddar, Parmesan, Fontinella, and Gorgonzola. It is--if I do say so myself--mouthwatering delicious. And while this may not be the heart-healthiest meal you can eat it is easy to make, versatile, and delicious (did I mention how delicious it is). The recipe is really simple. It's basically a Bechamel sauce (milk sauce thickened with roux) into which one or more cheeses are added, and then it's folded into cooked macaroni (or other pasta). 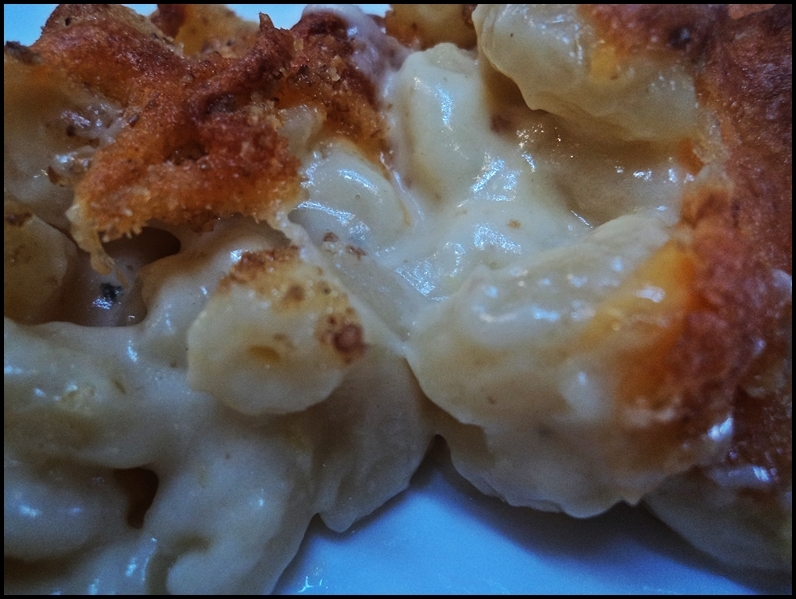 It's usually topped with something--I use a bit more cheese and breadcrumbs, but crushed crackers, potato chips, and even corn flakes are not uncommon--then the whole concoction is baked in the oven until browned and bubbly. This is most often served as a side dish, but other ingredients can be added to make it more of a main meal. Vegetables will lighten it up a bit (fresh spinach and chopped broccoli are good choices), and more decadent options include--but are not limited to--foods such as ham, sausage, crab, shrimp, or even lobster. And if you want to reduce the artery-clogging cholesterol level of the recipe, some or all of the milk/cream may be replaced with chicken broth. Anyhow, this is really easy to make and way better than the all-to-common boxed variety...and you can make it in bulk and freeze it in increments (as pictured below). Preheat and oven to 350F. Boil the macaroni in salted water, drain, and set aside. Melt the butter in a heavy saucepan then add the flour, stirring to form a roux. Cook the roux over medium heat—while stirring—for a few minutes, then add the milk, cream, salt, and pepper. Using a wire whisk, stir the sauce over medium-high heat until smooth. Continue stirring until it is heated and thick. Cook the sauce for a minute or two then remove from the heat. Add the cheeses and stir until smooth. 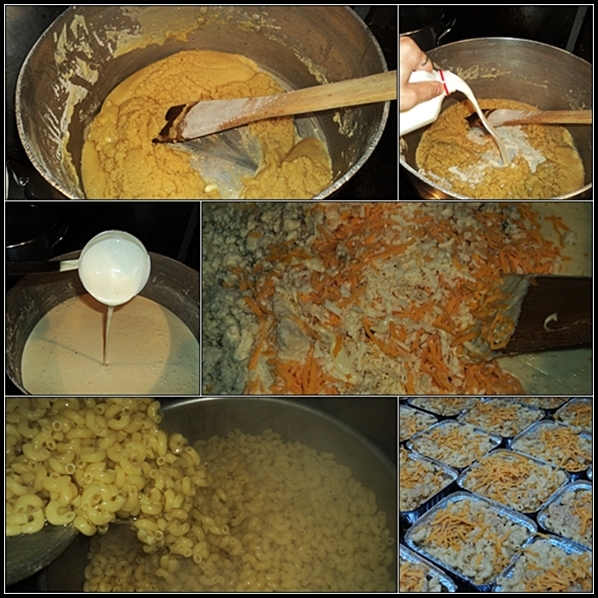 Add the cooked macaroni to the pot and gently fold into the cheese sauce. Transfer to a lightly oiled skillet or other oven-proof baking dish and sprinkle with the breadcrumbs. 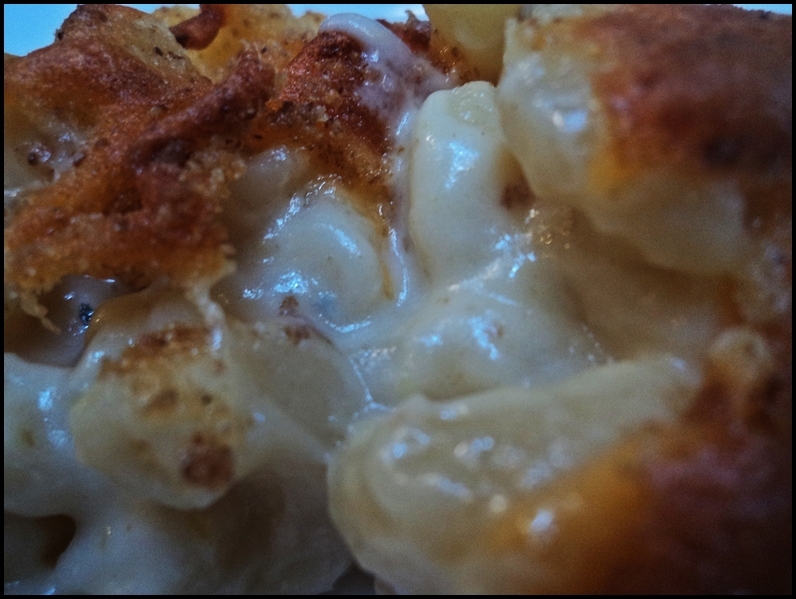 Bake the macaroni-and-cheese for about 20 minutes, or until it is hot throughout, bubbling, and golden.